Last year I made a post about Rudd's razor gang that would target Australian government workers. 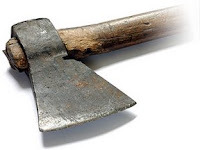 It has come to light that the axe will fall on 70 small business field officers. 4.7% usually worked more than 75 hours each week. This is hardly cutting "fat" in administration so that more can be "delivered to front-line services instead", as Rudd put it before the election. He has made a cut to government services that will directly affect hard working Australians whose businesses employ 3.6 million workers and generate 30% of the nation's economic activity.